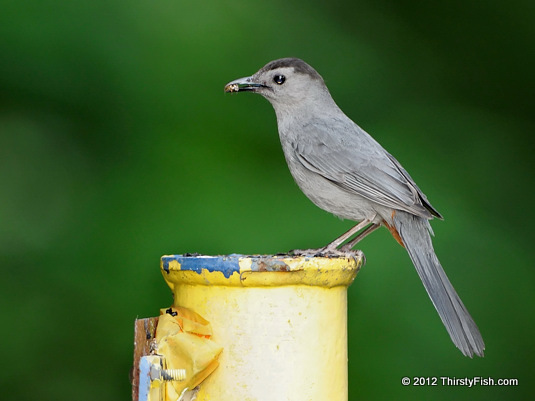 The Gray Catbird is one of the easiest birds to identify by call; It sounds like a cat. Just like its cousin the Mockingbird, the Gray Catbird mimics the songs of other birds, vocals of tree frogs and even mechanical sounds. It's native to North America, east of the Rocky Mountains and south of Canada. It is plain gray all over, with a darker head cap and a rufous patch under the tail. The John Heinz National Wildlife Refuge at Tinicum, is a small remnant of the largest remaining freshwater tidal wetland in Pennsylvania. During 1969, the area was threatened by plans to route Interstate 95 through it. Under legislation passed by Congress in 1972, it was acquired by the U.S. Fish and Wildlife Service. It was renamed in 1991, in honor of the late Senator John Heinz who helped preserve the Tinicum Marsh. The refuge is adjacent to the Philadelphia International Airport and some SUNOCO facilities. Five subsurface, crude oil pipelines run through the refuge. The Gray Catbird in the photograph is on one of the pipeline markers. On February 5th, 2000, one of the pipelines developed a crack and 192,000 gallons of oil seeped into the refuge habitat. It took months to clean the initial effects of the spill. 12 years later, although some of the effects of the spill are still observable, this "urban" refuge is home to a variety of wildlife, over 300 species of observed birds, frogs, turtles, deer, opossums, fox, raccoons and muskrats.